The Metropolitan Transit System recorded 47,000 additional trips — a 15 percent increase — during the “Free Ride Day” on Tuesday. 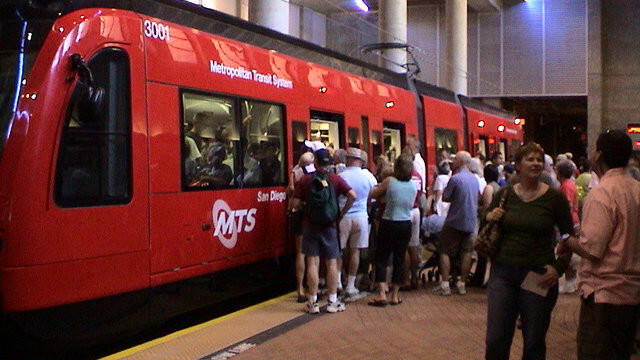 MTS and the North County Transit District provided free trips on buses, the San Diego Trolley, and Coaster and Sprinter trains. Trolley ridership was up by 19 percent, and MTS bus ridership by 12 percent. The Sycuan Green Line had the biggest jump in the system, increasing by 37 percent or 13,000 extra passenger trips over the same day last year. The increase in NCTD ridership on Tuesday has not yet been released. Free Ride Day was held in conjunction with the SANDAG iCommute program to promote National Rideshare Week and to educate people about transportation choices available in the San Diego region.